Chicago police and firefighter/paramedics responded about 5:33 AM Monday April 15, 2019 to a report of a multi-vehicle crash with injuries on outbound I-290 at 41.875703, -87.645392 (I-290 and I-90/94 Chicago, Il). Police and firefighter/paramedics received a report of a multi-vehicle crash with injuries on outbound I-290 over I-90/94. Engine 1’s crew reported their fire engine was rear-ended right above I-90/94. There were possibly two separate crashes in the area of I-290 and Halsted and I-290 and I-90/94. 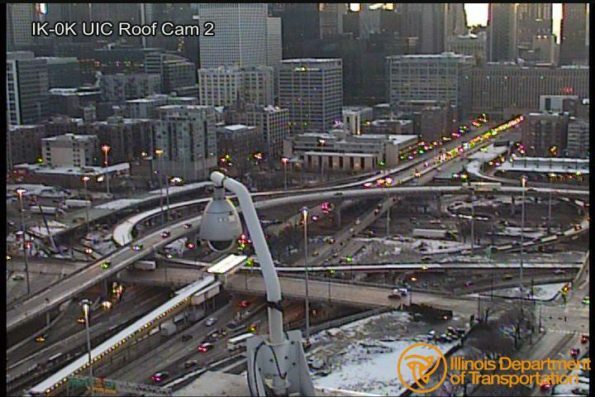 IDOT Byrne Exchange crash UIC Roof Cam.